Do I have a food allergy or is my stuffy nose a cold? In the season of stuffy noses and influenza body aches, food allergies are overlooked as a cause of discomfort. Feelings like sneezing, stomach pain, and runny nose all sound like cold season aches. Almost 15 million people in the U.S. have a food allergy. Two children in a class of 26 first-graders will have food allergies. About 1/3 of children with food allergies have allergies to several foods. What are the signs that I have a food allergy? The signs of food allergies can appear in minutes or can take hours. The symptoms of cold take days to a week. Food allergies can happen immediately when the food is touched or eaten. Or the allergic response might take hours. Mild symptoms are hives, itchy mouth, nausea, stomach pain, vomiting, diarrhea, nasal congestion, runny nose, sneezing, slight dry cough. 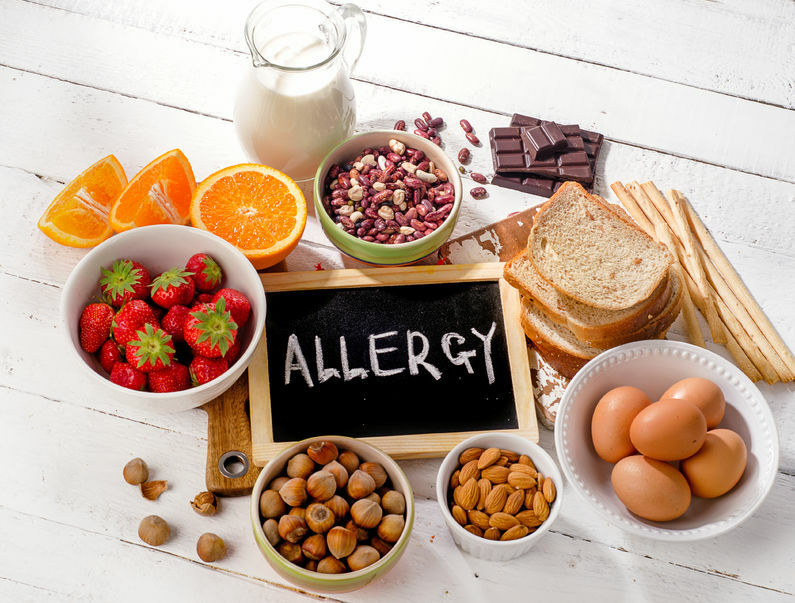 Severe symptoms of a food allergy, also known as anaphylaxis, are swelling of the throat, tongue, or lips making breathing difficult, drop in blood pressure, chest pain, loss of consciousness. Which foods cause the most allergic reactions in people? We eat food from everywhere on the planet. Eight major food allergens cause the most severe reactions. Milk, egg, peanut, tree nuts, wheat, soy, fish, and crustacean shellfish cause the most severe allergic reactions in people overall. Young children are most allergic to milk, egg, and peanut. Teenagers and young adults are most allergic to peanut, tree nuts, wheat, soy, fish, and crustacean shellfish. Food allergies are very unpredictable. No cure exists for food allergies. A person can develop a food allergy at any age. The symptoms of a food allergy can sometimes be mild and sometimes severe. Once people know they have a food allergy avoidance is key to preventing another allergic reaction. In the event of exposure that causes an acute allergic response or anaphylaxis, epinephrine is given to stop the anaphylaxis. Who has the most severe response to food allergies? Food allergy reactions are no laughing matter. A severe response to a food allergy can include death. Fatal anaphylaxis can occur in anyone with a food allergy. Teenagers and young adults are at the highest risk to have a severe allergic reaction to food. Do you know the signs of fatal anaphylaxis? Do you know what to do if someone needs epinephrine to stop an anaphylactic shock? Get educated about saving someone’s life. Visit The Beating Heart Center to get the skills to save a life today.